Applying to CCD Innovation to understand the world of food innovation seemed, in my head, to suppose a certain scientific environment: one comprised of vast numbers of tiny bottles filled with hyper-concentrated-who-knows-what in ultra-sterile laboratories, logbooks filled to the brim with the anguish of hundreds of statisticians in the pursuit of ultimate flavor, and a grim, if regulated, corporate environment with masters of the tastebud denoting the desires of the mass public to lesser, flavoring-affiliated chemists. 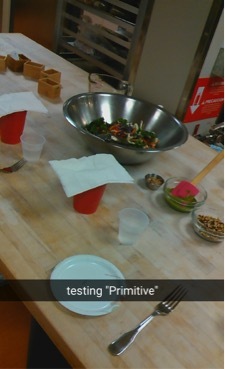 Thankfully, rather than this exhilaratingly impersonal corporate-gray hell, I was introduced to a very personal line of work, in a company numbering in the very low double digits, where folks spoke freely and happily with one another on the common goal of making darn good food for a whole lot of people. One of my distinct memories walking in (apart from noticing Pixar studios being literally across the street), was to immediately begin tasting—absolutely the most important part of creating good flavor. 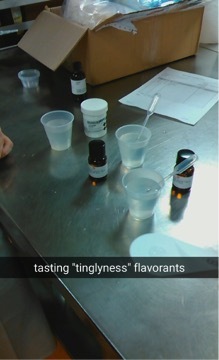 Welcomed into the finely furnished kitchen, we immediately started off the day with a test of a new shipment of sensates: a kind of flavoring that doesn’t necessarily attempt to create a particular flavor, but rather a sensation, these ones being focused on tinglyness. Mixing solutions of these various chemicals with water on a precision scale was an exciting awareness of the practical purpose of my scientifically academic learning. And tasting them? These sensates, oh what a sensation! The first wasn’t particularly appealing, sort of the feeling you get on your tongue after chewing on a big load of spinach, but without the tackiness on the teeth. Interesting, but not appealing. Then, one that felt like nothing upon tasting, but with the first breath brought a wonderful glacier-esque freeze into the mouth. Refreshing! The next, the numbing effect of Sichuan peppercorns, but without any of the heat! Very interesting, but not particularly pleasant. Within these couple of minutes, I had already been bombarded with an absolutely wonderful amount of sensations. Not only upon the tongue, but the sensation of an awareness that this was a pleasurable fit, that I could absolutely pursue in the future, as a career! The rest of the days were greatly pleasing as well, consisting of aiding the two main cooks in the kitchen, talking with the staff of the company who gathered up all relevant information of current food trends and then republished them for use by other similarly innovative food development companies, and a flavor chemist that was great fun to argue with! I was able to step into business meetings and have an opportunity to listen in on dealings, refer to our various secret projects via cleverly related codes, and peruse the archives of previous food developments and take ganders at their correspondence. One of our project titles, of a substance that shall not be disclosed! It was absolutely enlightening to observe how a small company like this can interact with so many enormous ones and still maintain a great sense of unique self. Not only that, but they greatly influenced my perception of how much I can do as a single person, such as taking on an entire division and field of work, and being successful at it! While I am not absolutely certain that this is the exact career path in life that I hope to follow, it has given me confidence that it is one of many potential options in my life, and has allowed me to feel secure in my ability as a worker, and that my widespread interests are not for naught.